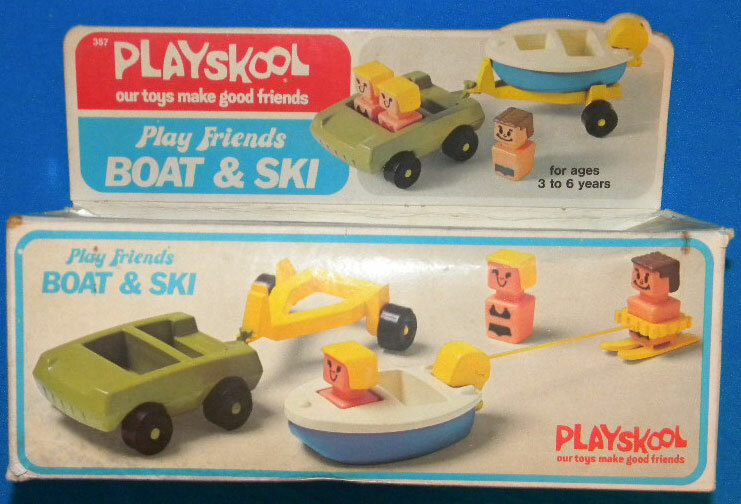 Description: This fun playset lets kids haul the boat to a lake to go boating and skiing. 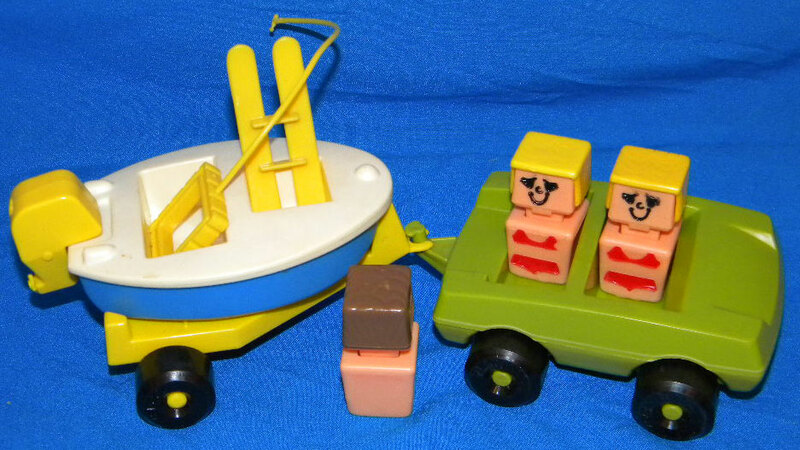 The boat was used in the #471 Emergency Squad, but all other set pieces are unique to this set, including the 3 Play Friends wearing bathing suits. PSK155 - Car - Green (olive green) squared car with 2 rectangular seats (seats 4) and a triangular hitch on the back (to attach trailer). Rolls on 4 black wheels (marked Playskool) held on via green (olive green) plastic rivets. 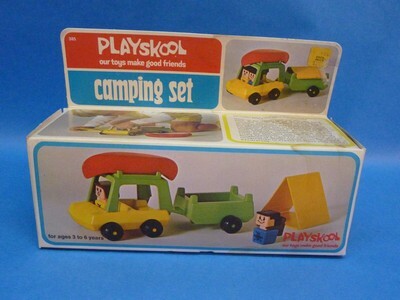 Bottom of car is marked, "Playskool, No. 485, Chicago, Illinois". Measures 5-1/8" long x 3-3/4" wide x 1-1/2" tall. PSK156 - Trailer - Yellow triangular frame trailer that rolls on 2 black wheels (marked Playskool) held on via yellow plastic rivets. Has a C-shaped clamp on the front (to attach to car). 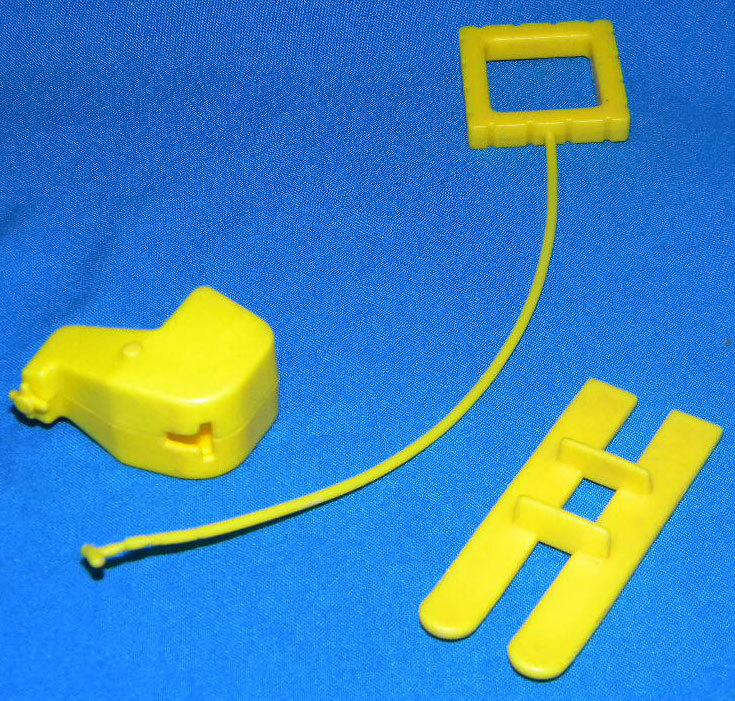 PSK157 - Ski Rope - Yellow flexible plastic "rope" with a small t-peg on one end (fits inside hole on top of PSK126 boat motor) and a square "loop" on the other end. The loop fits around the Play Friends figure body. PSK158 - Skiis - Flat yellow skiis, attached via 2 thin strips in the middle. Play Friend figure fits on the skiis held in place between the 2 strips). 2 each - PSK13 - Yellow hair, flesh-colored body with red bikini print on front side. PSK159 - Brown hair, flesh-colored body with blue shorts print on front side.